At Dollar Signs and Graphics we have been designing and printing door hangers for years. Our graphics designers will create door hanger that will catch your customers eyes. 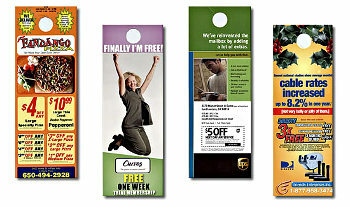 Door hangers are one of the least expensive and most effective forms of marketing. You can have your door hanger designed, printed and delivered for less than the price of stamps to do the same thing! Plus the door hangers won't get mixed up with all the other mail.